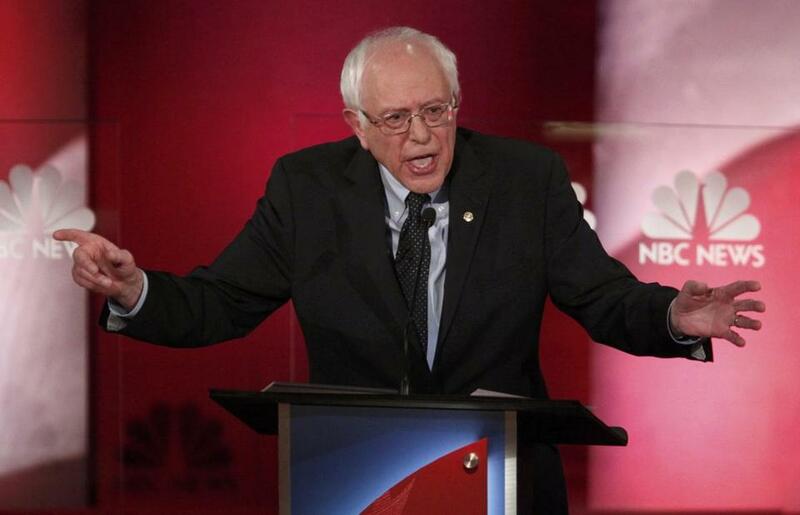 Senator Bernie Sanders spoke at the NBC News-YouTube Democratic presidential debate in Charleston on Sunday. Sunday night, I watched the fourth Democratic presidential debate so you didn’t have to. Initial impression: Hillary Clinton, Bernie Sanders, and democracy won. This was a substantive debate, devoid of the histrionics, name-calling, and fact-free pronouncements that are pro forma in the Republican presidential confabs. Both of the leading candidates did a good job of playing to their respective bases of support. Clinton came across as the pragmatic, level-headed, won’t-rock-the-boat candidate; Sanders as the passionate reformer who wants to start a revolution. As for Martin O’Malley, he seems like a nice man who has no chance of being elected president. Now for my deeper impression of the debate: even with his rising poll numbers in Iowa and New Hampshire, I find it increasingly difficult to take Sanders seriously as a presidential candidate. Maybe it’s the fact that he’s 74, would be the oldest man to ever become president, and yet couldn’t be bothered to release his medical records until a Clinton surrogate attacked him for it. Maybe it’s that Sanders finds a way to answer virtually every question by turning it back to another predictable and one-dimensional attack on Wall Street and big money. Maybe it’s that he gets away with proposing unrealistic policy ideas that have little chance of being passed even by Democrats in Congress, let alone Republicans, and then gets praised for being authentic. Sunday night Sanders finally released his single-payer health care plan, which is all of eight pages and provides little detail on how he’ll implement a complete restructuring of the US health care system. That’s at least an improvement over his plan for breaking up the banks, which is four pages and just as short on detail. Maybe it’s that every time he answers a question on foreign policy and national security, it’s blindingly apparent that not only does he not understand foreign policy and national security, he simply doesn’t care to know more. I mean, only Bernie Sanders could answer a question about instability Middle East by pivoting to an attack on wealthy nations like Saudi Arabia, which he repeatedly says has to play a greater role in the civil war in Syria, as if no one on his staff could bother to tell him that Saudi Arabia is already playing an important role in the civil war in Syria. Maybe it’s that his political pronouncements and calls for revolution increasingly remind me of the most annoying classmates in my political science classes in college. I’m sorry, but that is a maddeningly simplistic — and wrong — explanation of how American politics works. On the one hand, Sanders is right — those are powerful interests. But so are doctors and hospitals, who’d pay a huge price if single payer became law; so are Republicans, who fought tooth and nail to defeat Obamacare and would do the same for a single-payer plan; so are Democrats, who couldn’t even support a public option for Obamacare and are unlikely to support single payer; so are Americans, who may not be inclined to support another restructuring of the health care system — a few years after the last one. It’s not just about money; it’s also about a political system constructed and reinforced to block the kind of massive reform Sanders is advocating. Money is important, but it’s not even close to the whole story. How someone who’s been in Washington as long as Sanders can believe that all that stands between doing “what the American people want [Congress] to do” is something as simple as reforming campaign finance is stunning. Sanders, who brags the NRA gives him a D- rating, is the same politician who supported legislation giving gun manufacturers immunity from civil lawsuits and voted against the Brady Bill. Why? Perhaps it is because Sanders comes from a state that has few gun control laws and lots of gun owners. Yes red-state senators who oppose gun control receive contributions from the NRA. They also have constituents who oppose gun control measures and vote on the issue — like Bernie Sanders. It’s as if in Sanders’ mind, parochialism, ideology, or politics plays no role . . . in politics. This is frankly what’s become so frustrating about Sanders campaign. I give the man credit for raising issues all too rarely heard in presidential debates, and as a protest candidate, Sanders is playing a vital role in the political process. But now that Sanders’ campaign has gathered steam — and he is ludicrously claiming that he’s more electable than Hillary Clinton — Sanders needs to do more than just sound the same tiresome platitudes and one-dimensional arguments about the evils of Wall Street. He needs to take the job of running for president seriously. If Sunday night was any indication, that’s still not happening. The simple fact is that there were three candidates on the debate stage Sunday night — and only one of them is qualified to be president. It’s not Martin O’Malley, and it’s not Bernie Sanders.